Jenny Dearborn, EVP Human Resources at SAP, and HCM leaders from more than 20 award-winning global organizations will present leading practices at HCM Excellence19. The 2 1/2 day event is the perfect way to kick off the new year, with actionable research and insightful thought leadership. Brandon Hall Group’s Mission is to Empower Excellence in organizations around the world through our research and tools each and every day. 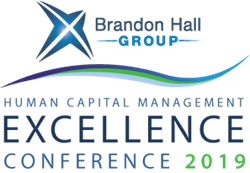 The HCM Excellence Conference is Brandon Hall Group’s annual event to share with everyone leading practices that we have found through research as well as engagements with organizations around the globe. This year’s keynote speaker Jenny Dearborn, Executive Vice President Human Resources at SAP, will amplify that message in her session, The Future of Work and the Critical Role of Learning in the Digital Era. Her first book, Data Driven: How Performance Analytics Delivers Extraordinary Sales Results, debuted at #1 on Amazon in the New Business Release category and was in the top 10 of “What Corporate America is Reading” in 2015. Her second book, The Data Driven Leader: A Powerful Approach to Delivering Measurable Business Impact Through People Analytics, was published in November 2017. The HCM Excellence Conference also features an awards gala honoring 2018 Brandon Hall Group HCM Excellence and Technology Award winners. Select honorees will share their leading practices alongside Brandon Hall Group’s research, providing a powerful blend of research-based and market-tested practical advice. Around 500 executives from world-class organizations are expected, representing more than 30 industries. For additional information and to register, visit http://www.brandonhall.com/excellenceconference. Save $200 with early-bird pricing, available through December 7th, with registration open through January 22, 2019. For additional information, please contact Mike Cooke at mike.cooke(at)brandonhall(dot)com or (561) 306-3576.